According to the National Institutes of Health, 8 out of every 10 people will experience some kind of back pain throughout his/her life. This year alone, about 22 million Americans will visit a Chiropractor, of which, 35% will be due to neck and back pain. This is one of the top reasons patients go to a chiropractor. Back pain can be caused by many reasons, such as having poor posture, wear and tear, overuse, a car accident or sport injury, but it all really comes down to a problem with the bones and joints in your spine. When these joints become stuck or immobile, they can create inflammation in the area. Over time, the inflammation builds up, irritates the nerves in the area and causes you pain. This problem is called a Subluxation. Chiropractic removes the subluxation to allow your body to function at its greatest potential. 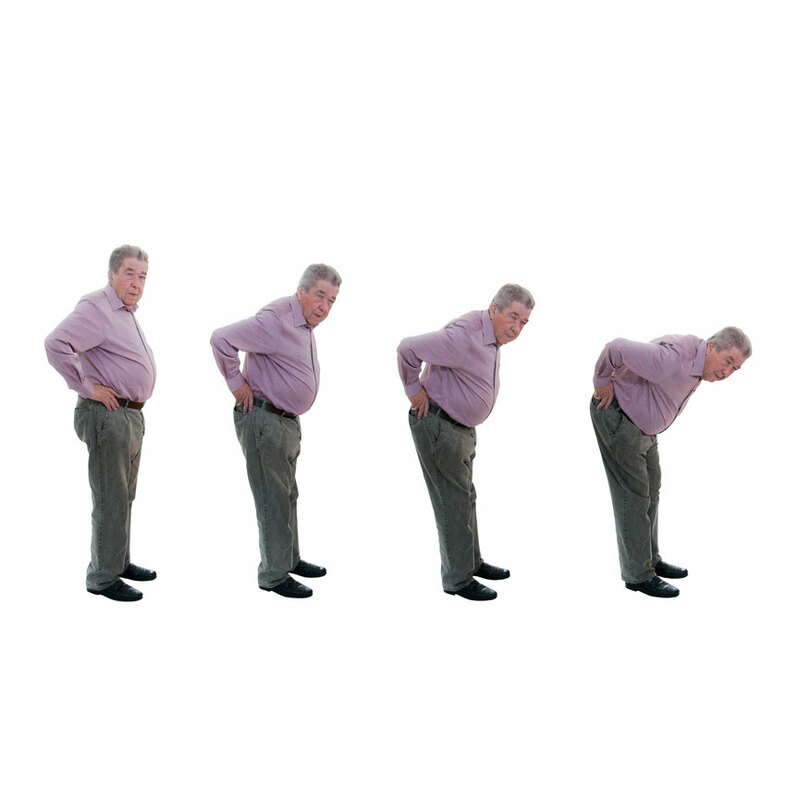 In July 2011, a 66 year old, retired, male Veteran presented to the office with low back and bilateral hip pain. He was walking very slowly and hesitantly with a cane. His chief complaint was that he could not bend over forward to pick things up off the floor, not due to pain, but it was physically impossible, for about ten years now. He finally made himself come in for a consult and exam because he had dropped his keys in a parking lot and could not bend over to pick them up. He had to kick them across the lot until he got to wall where he could support himself to lean over sideways and pick them up. In addition to not being able to bend forward, his hips would start intensely aching after walking about one block, or from his car to the store entrance. He would rely on his cane and an occasional back brace to get him to a motorized cart in the store. All of his activities were based on if he could make it to his destination before the pain was unbearable and if there would be a place for him to sit once he got there. Once sitting, the pain would diminish over the next hour. On the pain scale, where 10 is excruciating pain and 0 is no pain, he rated his pain a constant 5, daily, and escalating from there as he walked. The patient’s overall health was poor. In addition to being overweight because of his inability to be active, he had suffered multiple heart attacks, had high blood pressure, congestive heart failure, diabetes and cancer that was in remission. He had been in multiple, severe accidents during his service in the military and several minor car accidents. He tried to find relief using massage, but the massage would only create lasting results for one day. The patient’s range of motion of his neck and low back was severely restricted in all directions. Many of the orthopedic and neurological tests were difficult or unable to perform due to the rigidity of his body. While nothing elicited sharp pain, all movements were described as tight, stretching, or resulted in a muscle spasm. Palpation of the patient’s back revealed multiple subluxations, or misalignments of joints, in his pelvis, hips, low back, mid back and neck. The muscles on each side of his spine were so tight and hard that it was difficult to feel the vertebrae. When the patient flexed forward, his finger tips measured 14 inches from the ground. The patient began treatment right away. His treatment plan consisted of Chiropractic adjustments to realign and mobilize the spine and pressure point therapy to relax and loosen the muscles and increase blood flow. He received treatments 2 times a week for 3 weeks, once a week for 3 weeks, every 2 weeks for 3 visits, every 3 weeks for 3 visits, and monthly thereafter. An Activator Adjusting Instrument, or spring loaded instrument, was used to deliver the Chiropractic adjustment. This devise is very specific and gentle and especially effective in delivering an adjustment even when the body is so rigid and the joints are surrounded by spastic muscles and excess soft tissue. After every adjustment, it would be followed by pressure point therapy of the mid to lower back, hips, gluteal muscles and hamstrings to release the tension of the muscles and decrease spasms, and light stretching of the quadricep muscles. The patient was given home care instructions that included daily stretching of his hamstrings and gluteal muscles, multiple times a day. After the patient’s first adjustment, he reported that he felt great for one and a half days and then everything tightened back up. After his second adjustment, he could feel the blood flowing through his legs better, which normally were swollen and had decreased sensation. On his ninth visit the patient was ecstatic that he had visited his doctor at the VA hospital and did not use his cane to walk from his car all the way through the building to the office. After ten visits, the patient had completely stopped using his cane, his hips still hurt after walking a distance, but he could go further now and when they did start to ache, he would stop, stretch for a minute and continue on walking. His finger tips were now 8 inches from the ground. The patient continued to stretch his legs multiple times a day and even started walking on a treadmill daily. He forgot where his cane was and rated his daily pain level to be a 1-2 out of 10. By then end of March, 2012, his 20th visit, he proudly showed off that his index finger could skim the ground just enough so that he could pick up his keys on the ground! The patient continued to progress, but at a slower rate when his visits became monthly. He eventually was able to steadily hold his fingertips to the ground and pick up paper off the ground. His friends would even playfully drop playing cards on the floor to make sure he could still bend over and pick them up rather than them having to help him. To this day, he continues to come in for maintenance tune ups and still stretches regularly. He is the proud owner of a three wheel bicycle that he rides around town, up to 8 miles, to help with exercise. Through a doctor assisted nutritional program he has lost over 40 pounds. Although he has had other set backs with his health that have prevented him from coming in for his tune ups monthly and consistently riding his bike, he always returns, a little tight, but nothing that an adjustment doesn’t fix. The patient’s ability to attend all of his appointments, determination to succeed, and daily motivation to stretch multiple times a day, assisted greatly to his success. In conclusion, Chiropractic, and specifically the Activator Adjusting Instrument, is an effective method to treat low back and hip pain, and remove the problem to restore proper function.